So with it being Christmas Eve tomorrow, I am super busy as you can imagine! Now being busy is nothing new in our home, so I can't and won't use that as an excuse for having ignored my blog and all of you these past few months. I've just been lazy! So now, I have to play catch up. Let's go back to Thanksgiving. Our Thanksgiving was great - I am so thankful for my husband and kids! They really make the holidays even better :) I cooked and my daughter helped where she could - she is only 8 so a lot of her help involved me helping her, LOL. I'm happy to say everyone was happy with dinner! Ken, our elf on the shelf, returned on Thanksgiving since our tree was up already! So this year we decided to begin a new tradition. 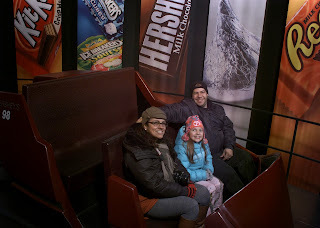 A trip to Hershey Park on the weekend right after Thanksgiving! We headed out Saturday morning, and unfortunately on the way to Hershey, our son got sick! Ugh, just our luck! We had to pull over 2-3 times so he can puke out the window. We stopped for lunch, my son didn't eat, and then we went to the hotel. After much debate, we decided to go to Hershey Park without him. He wasn't in the mood at all, he just wanted to sleep and we only had the hotel until Sunday so we had to go that day, if not we'd lose all our money spent on the tickets. So we headed out. Upon arriving at Hershey Park, I wished we would've waited a bit later. The park looks great and is decorated beautifully, but at night it would've looked amazing!! We had a great time! Baby girl loved it here, she really enjoyed the zoo and then rode a couple of rides. After we walked the entire park, which we did before sunset since walking with my husband is like jogging in a marathon and it doesn't take long to get around these amusement parks, we headed to the Chocolate Factory! 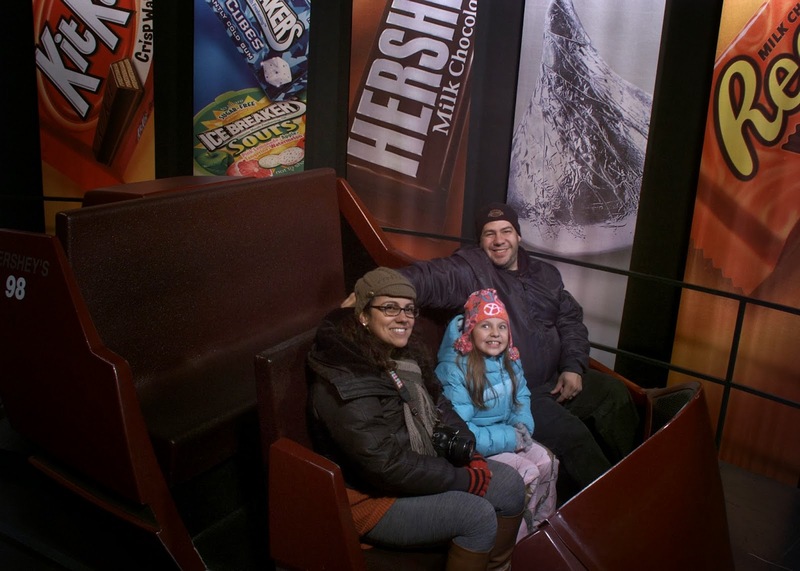 Here we took the free ride to learn how chocolate is made! It was fun, but we couldn't help but miss our son! Both my hubby and I felt so bad for him. The ride was over, so now we took a stroll through the market place and stopped at the bakery for some chocolate chip cookies. This place smelled amazing!!! After leaving here, we went through the Hershey Sweet Lights. This was a drive through several roads that were all lit up, and I thought it was very cute but really not worth the $20 we paid per car. Atleast we can say we saw it, but next year we'll be skipping it! Christmas Day with Little Sleep!! Merry Christmas from our House to Yours!! !